DSM is a unique and highly impressive plug-in at a great price. Prepare to make things easier on yourself. Allows you to apply the EQ and dynamic curve of one track to another. Simplifies many complex production tasks. Can turn a badly recorded sound into something more than usable. 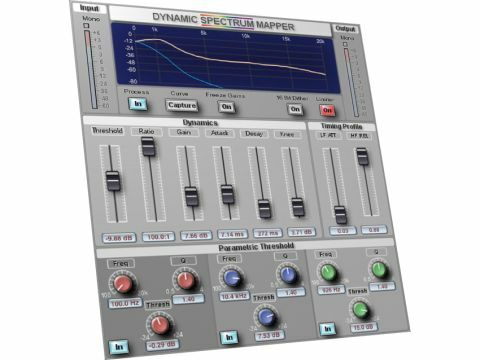 With its separate dynamics and EQ sections, you might at first glance be mistaken into thinking that the Dynamic Spectrum Mapper is a multi-band compressor, and in some ways, it's potentially the simplest multi-band you have ever used. But, how it processes goes way beyond how most multi-bands work. The big difference between the DSM and everything else is the magic Capture button. Press this with audio playing through and the DSM analyses the frequency and dynamic spectrum of the source. 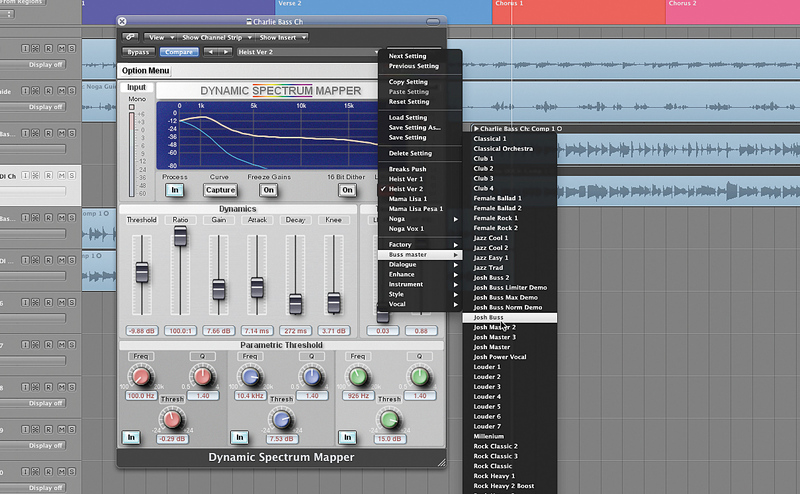 It then processes the sound dynamically in relation to the audio spectrum you captured. As it's working with lots of compression bands and a map of the material, you can use really extreme settings without pumping effects, and then make radical changes to the overall sound without losing its inherent character. For sound sources that have problems like sibilance or bass boom you just capture a good passage and then apply it to the whole thing. As you work more with the DSM you build up a library of your own presets that you can then call up when you have a similar need. First up, let's consider sibilance. De-essing can be time consuming and pretty tedious. With the DSM, it's a simple matter of inserting the plug, loading a preset and curing the problem. This spoken word example provided on the DVD sounds pretty nasty but all we did to correct it was exactly that. When you have a complete vocal take which contains some nasty sibilant moments all you do is hit the Capture button during a non-sibilant passage. When you apply this to the vocal any frequency that goes above the captured curve is compressed by the DSM, removing any sibilant peaks, but retaining the basic character of the vocal sound because it was created from it. Another pain is the badly recorded instrument. The acoustic guitar that appears next is dull and lifeless. Because there is no great sounding section we loaded an acoustic guitar preset from the DSM library. It immediately sounded better but we wanted to take it further. Using the parametric threshold controls we pulled out some of the lumpy low middle and bass frequencies. Although these look like EQ controls, they don't work directly on the sound. Instead, they adjust the shape of the captured curve either allowing more or less of certain frequencies through. By setting the threshold to -24dB the whole sound was seriously under control, but we still wanted some zing. Using a high setting for HF release in the timing profile section, the DSM let lots of lovely clear controlled top end through and gave the finished sound you hear. Considering how much compression we are using the end result is unbelievably clean and free from pumping. Try doing that with a conventional compressor and EQ chain. Getting different drum loops to sit together can be hard work. With the DSM it's easy. The untreated loops you can hear below have really different sonic characteristics. We pumped up the first loop using one of the DSM loudness presets then we inserted another instance on the same track. We captured the curve of the first loop, saved it as a preset and then applied it to the other loops. The results you hear took just two minutes to achieve. Using conventional techniques would have been far more complex and taken a lot longer. Finally, we tried a mastering job on a complex track containing some extreme dynamic, spatial and frequency changes. We captured the curve of the end section and then applied it to the whole track. Higher settings of LF attack slow the attack time of the lower bands allowing the bottom end to breathe. Higher settings of HF release lengthen the decay times in the higher bands, opening out the top and adding brightness. What we got was a great increase in loudness, a far more cohesive frequency spectrum, no apparent compression artifacts and no loss of spatial information. We've had the DSM for a while now and we really do use it constantly. Whether we're fixing a problem, pumping up the drums, radically altering a loop or maximising a whole mix it is our first port of call and more often than not, our last. It saves time, massively improves workflow and sounds bloody great. Thoroughly recommended.